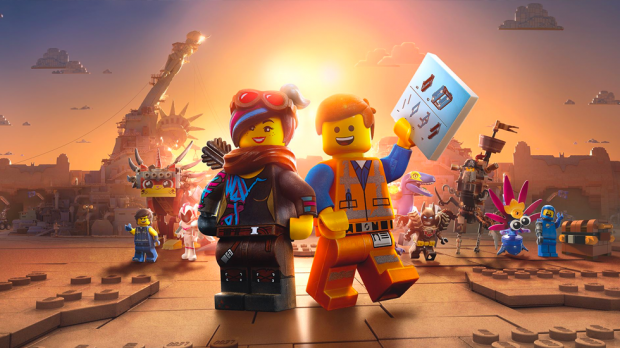 The Lego Movie was an unexpected treat, a film that worked on a number of layers pleasing both the young and old demographic with its jokes, visuals and story. Does The Lego Movie 2: The Second Part manage to catch that same spark of creativity? After the Duplo invasion, triggered by Finn’s (the boy who’s imagination was the catalyst for the first film) sister now being allowed to play with the Lego collection, Emmet’s (Chris Pratt) Lego home has fallen into a post apocalyptic wasteland. Everyone has gotten dark and broody due to the continual war with the Systar system, with the exception of Emmet, who has retained his optomistic ‘Everything is Awesome’ attitude. However when Lucy (Elizabeth Banks) and a number of his other friends (voiced by the impressive collection of Will Arnett, Nick Offerman and Alison Brie) are kidnapped, Emmet must travel via the Stairgate to the Systar system. Unfortunately, the rescue attempt may have disastrous consequences, as it may trigger the end of everything, Momageddon. The issue with The Lego Movie 2: The Second Part is it’s certainly a manufactured piece. It’s trying so hard to make lightening strike twice, that you’re always aware of the miles of copper cables, attached to a forest of lightening rods, and the book of 1001 insults to Thor God of Thunder tucked underneath its arm. The film is constantly struggling to recall its past glories, rather than organically progressing as the first film did. A common problem among sequels, but one that is acutely apparent here, perhaps due to the fact that we have already had a few quasi related sequels to this world through The Lego Batman films. Whatever the case, you can always feel the effort that the script is taking to hit those same notes and themes that the original film did, and it detracts from the quality. Paradoxically though, when it does hit those notes The Lego Movie 2 is probably at its best. There are some deep themes that do come from this, exploring childhood and the expectations of adulthood, pitched against a background of projected stereotypical masculinity. Once again it is a kid’s film, that supports a more complex dive into the subject matter by adults. It is just never as apparently effortless about this as its predecessor was. At the end of the day, the result is still entertaining fare, with laughs for both adults and children, and a more philosophical message for both age groups as well. Pratt manages a decent double duty as both the naive Emmet, who is unable to adapt to the dark brooding atmosphere of the post apocalyptic world, and the extreme testosterone pumped galaxy defending archaeologist, cowboy and raptor trainer Rex Dangervest. Banks still has Lucy struggling with how she manages to be second fiddle to Emmet, despite being far more competent, and Arnett still slays as the overly self-aggrandising Batman. New to the franchise are Tiffany Haddish’s (Girl’s Trip) not entirely trustworthy shape-changing queen of the Systar system, and her overly cutesy but still deadly warlord voiced by Stephanie Beatriz (Brooklyn Nine Nine). Hence The Lego Movie 2: The Second Part is enjoyable, but while it doesn’t disgrace the franchise it is not really memorable in its own right. Copyright © 2019 X-Press Magazine – Entertainment in Perth. All Rights Reserved.